For 24 hours, Mayor Rahm Emanuel, Alderman Danny Solis and other city officials participated in a Fast for Families, which began on the eve on the feast day of Our Lady of Guadalupe last Thurs. Dec. 12. Mayor Emanuel wanted to show his support for immigration rights activists who had been on a hunger strike since November 12 at the National Mall in Washington D.C. in order to urge Congress to pass immigration reform including a path to citizenship. Mayor Emanuel made the announcement at St. Pius’ Church in Pilsen. Alderman Solis expressed how Congress’ inactions affect our communities. 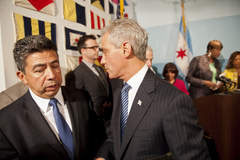 “Every day I see how our country’s broken immigration system affects undocumented families in my ward, whether its parents taking their kids to school, entrepreneurs running their businesses, or people living their lives, no one should live in the shadows,” Alderman Solis said. Mayor Emanuel and other city officials ended their fast on Dec. 13. Fast for Families: A Call for Immigration Reform and Citizenship, gathered civic leaders and community members to abstain from eating and drinking—except water—in order to shake policy makers to make decisions and enact reforms that will affect the 11 million undocumented in the U.S.